Since the beginning of the year I've been trying to work in my sketchbook every day. 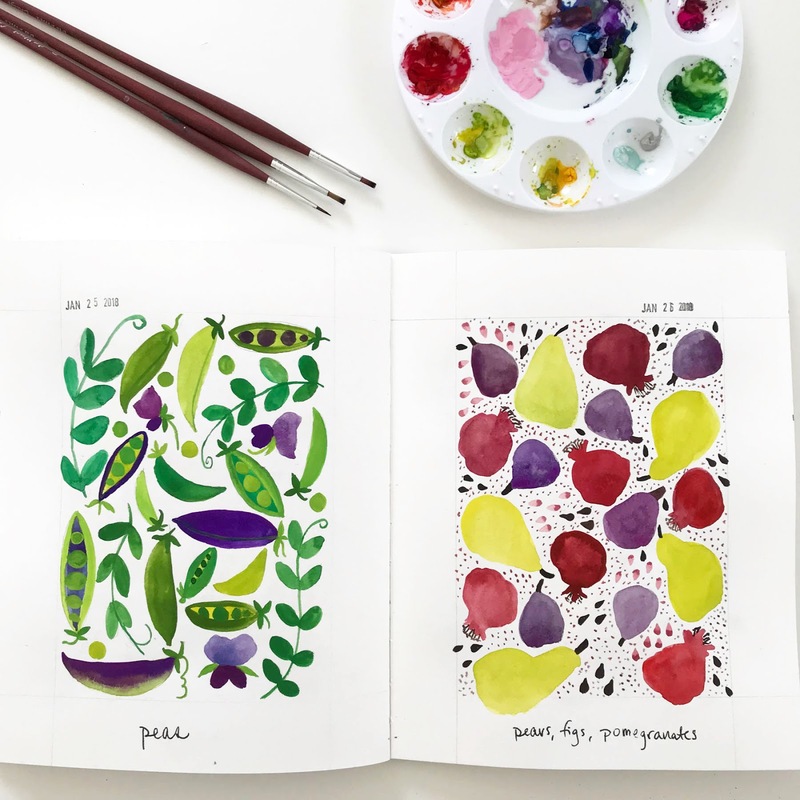 I started out in January by joining in Lisa Congdon's Daily Painting Challenge on Creativebug. I only missed the very last day (and made it up the next day). Each day Lisa demonstrated a different type of pattern, painted with gouache. For the most part it was fun, quick and easy. For every pattern there were so many possibilities and my ideas were flowing. 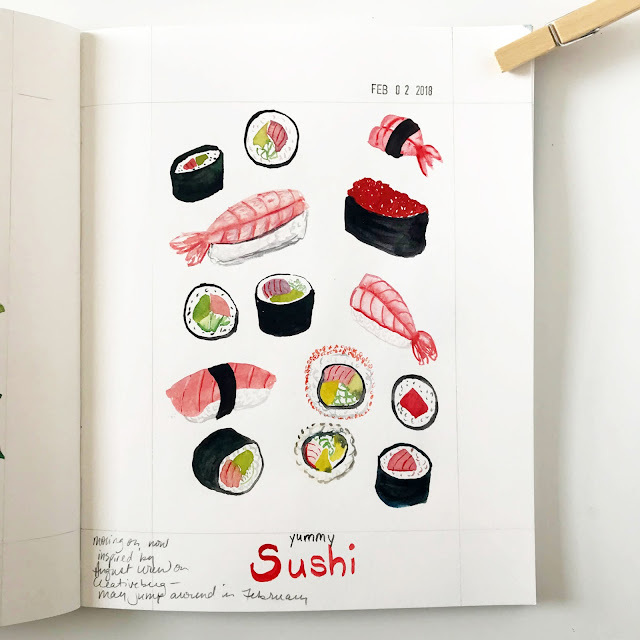 I used the same type of sketchbook that Dana and I used for 2x2 and it brought back feelings of energy and excitement of working on that project. 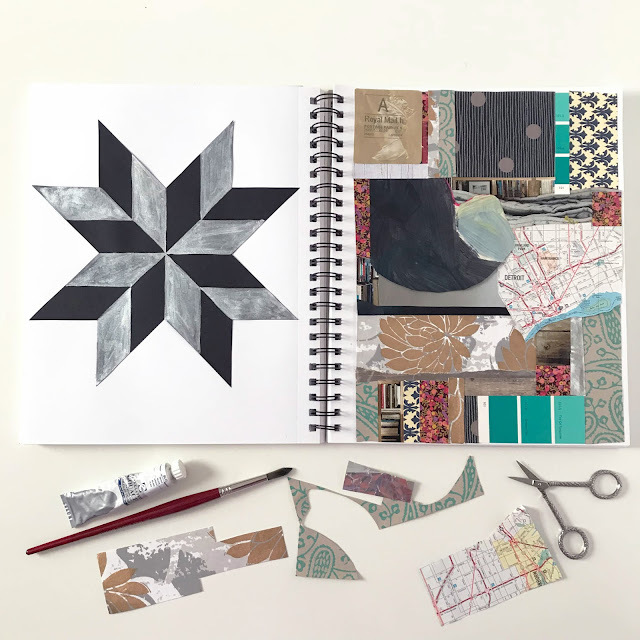 Often I tried to make the patterns on adjacent pages coordinate in some way or another or I thought about different patterns or designs that could go on the opposite pages. I definitely want to revisit some of the themes and designs (the peas and the beets were my favorite and I'd love to paint them with watercolor using good brushes and watercolor paper). I tried a few daily painting themes from Jennifer Orkin Lewis's Creativebug Challenge (changing it up a bit to fill the page in a similar way to Lisa's challenge). (The sushi was so fun to paint!). I also looked to garden catalogs for inspiration. And I did some simple pencil sketches in another sketchbook to get in the mood for a commission that I'm working on (Ashlie Blake recently shared some sketches she did as preparation for a commission and what she said about slowing down to do it really resonated with me**). What ends up on the page is less important than the daily practice of creating the page. Trying new things. Experimenting. Using media you're not familiar with. Drawing or painting subjects you've never drawn or painted before. All of those types of sketchbook play are important. They're fun. They help you grow. They spawn ideas. Before I came back to my daily sketchbook practice I had forgotten how valuable it is. It's so easy to push the practice aside in favor of More Important Things, but if we do, we do ourselves a disservice. If you've been wanting to start a sketchbook or to get back to a regular sketchbook practice, do it. Join a challenge. There are lots of challenges on Instagram (search for hashtags that include the word challenge, or look to other artists that you follow for inspiration). Creativebug has a number of "Dailies", classes where there's a different something that you create each day. Or start your own challenge. Inspiration is everywhere. 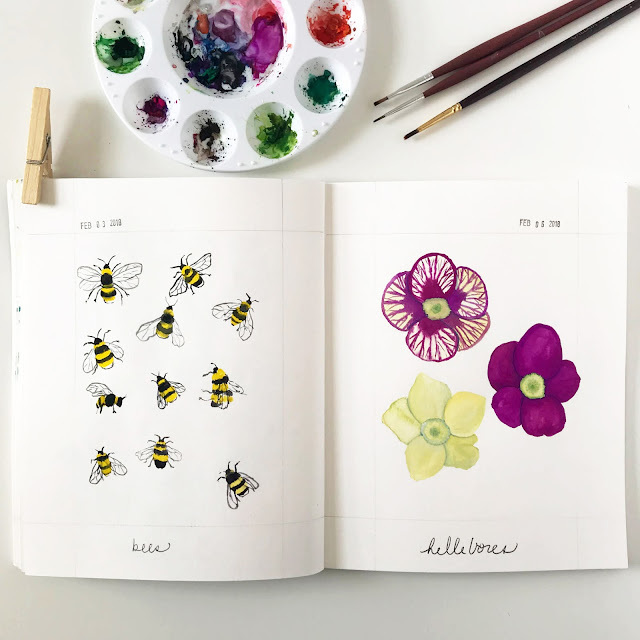 Create a list of 31 (or 28 or 30, depending on the month) things to paint or draw and do one every day. (My Skillshare Class, Jump Start a Daily Art Practice can help you get started with this). Alternatively choose one theme for a week or even a month (or longer). Do it small. 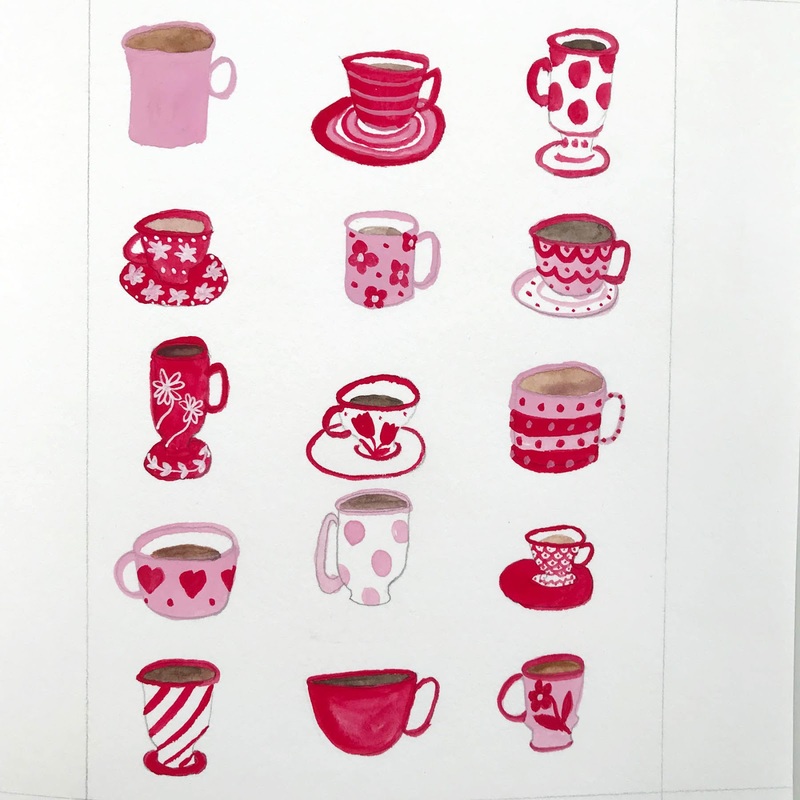 This year Kristen Afionis*** has been creating a tiny sketch each day in little boxes in her sketchbook that look like the page of a calendar (here's January's). Hold yourself accountable. Maybe that means sharing a photo a day on Instagram (though as I've mentioned before, sharing on social media can also be stifling). Maybe it means partnering with a friend and helping to hold each other accountable. Maybe that means dedicating a specific time each day for working in your sketchbook. Figure out what works for you and stick with it. Don't be hard on yourself if you miss a day. We're all busy. Some days we really don't have time or don't feel well or whatever. It's ok. But conversely, don't let too many days slip by or it's hard to get back into the rhythm of creating. Have fun! Although I use words like "work" and "practice", don't forget that this should always be a fun thing. Creating in a sketchbook should be joyful, not a chore. If it gets to be one more thing on your to-do list, weighing you down it's time to reassess and reboot your practice. *Overcome Creative Slumps with Easy Art Play is my most recent class on Skillshare. During the month of February I'm running a challenge with weekly themes. (You can try Skillshare Premium for only $0.99 for two months with no strings attached). One lucky participant will win a year's membership to Skillshare (if you're currently a member you'll get 12 months added to your membership). You can see all the details here. ** Ashlie was one of the Sketchbook Conversations artists. You can read her part of the conversation here. *** Kristen was another of the Sketchbook Conversation artists. You can read her part of the conversation here. I love these ideas! I totally need a kick in the pants, especially in winter! So glad to hear it! It's always helpful to get a kick in the pants. That book is really fun. It's on my art book shelf, but haven't looked at it in ages. Maybe I need to play around with it again. Thanks for the reminder! The little bees are wonderful observations! I am still unable to sketch or paint in my sketchbooks. I think I am feeling a bit down and can't face doing any challenges. I am going to start a no pressure glue book though. I didn't even know there was a thing until I saw them on YouTube. So I am going to glue images from magazines into a book with no real rhyme or reason other than I am drawn to the images. Hopefully this will get me to loosen up and maybe spark off some creativity elsewhere for me. I have been leaving comments here Anne but forgot to login before I did so. Therefore the comments were not published. Doh! On your previous post I wanted to congratulate you on the achievement of having your paintings exhibited in the library. If I lived nearby I would definitely go and see them in the flesh so to speak! Thank you, Simone! I'm sorry you've been feeling uninspired. I know how hard it can be to get out of a slump. Be gentle with yourself and know that you'll get there again. 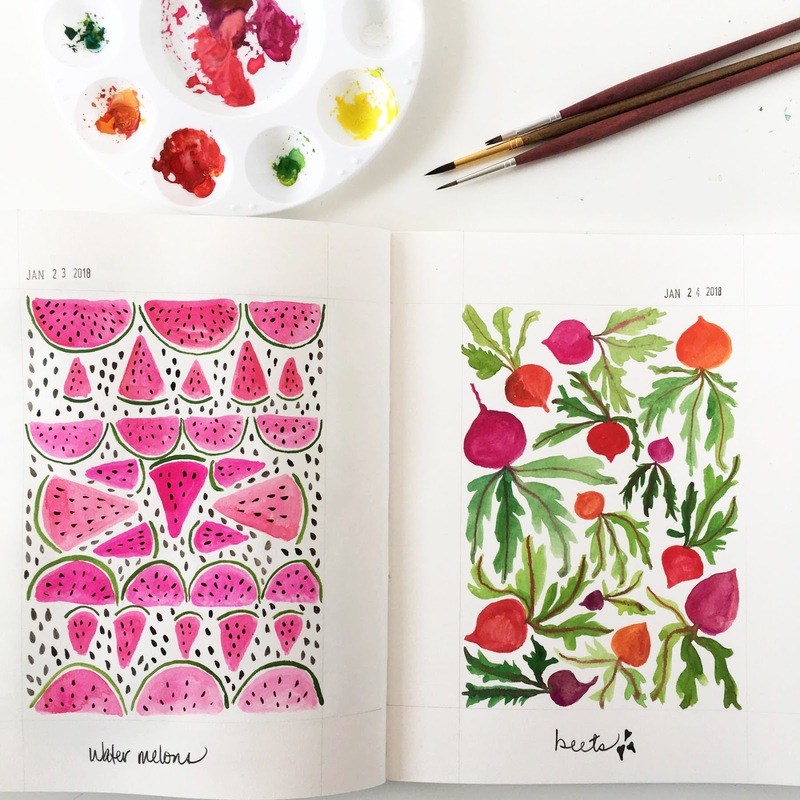 Sounds like your glue book might be just the thing for easy creativity! Thanks for leaving your comment even if you had trouble! Wouldn't it be fun if you lived nearby?